Molar incisor hypomineralization (MIH) is the hypomineralization of systemic origin of one to four permanent first molars, frequently associated with affected incisors.,, It is a qualitative defect of the enamel. It is also called as hypomineralized permanent first molars (PFMs), idiopathic enamel hypomineralization, nonfluoride hypomineralization, and dysmineralized PFMs. Koch et al. called these as cheese molars after carrying out the first epidemiological study. When ameloblasts are affected in the late amelogenesis stage of mineralization or maturation, a defect in the enamel translucence can occur. These defects are called enamel hypomineralization. A common pattern of enamel hypomineralization affects molars and incisors. This dental defect is called the MIH. It is clinically presented as white to yellow to brown demarcated enamel opacities of different colors, occasionally undergoing posteruptive breakdown due to soft and porous enamel.,, Posteruptive enamel breakdown is a defect that indicates a decrease in the enamel depth after eruption. The posteruptive breakdown exposes the dentin which is very sensitive, and because of this, the tooth becomes vulnerable to rapidly progressing caries as the children cannot carry out oral hygiene very effectively., Cavities and complete coronal distortion can occur requiring restorations. 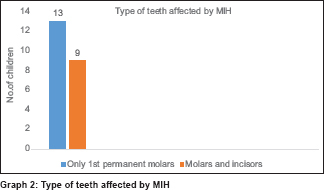 Knowledge of the magnitude of MIH is desirable as it is vulnerable for consequences such as rapid caries development, early enamel loss, and sensitivity. Hence, this study was conducted to evaluate the prevalence of MIH in schools of Chennai. A descriptive cross-sectional study was done in four different schools of Chennai. The schools were randomly selected which include two private schools and two government schools. All the schoolchildren of 7–12 years of age were examined. The principal, teachers, and students were informed about the study and their consent was obtained. The research was conducted with approval from the Institutional Ethical Committee. The inclusion criteria were children of 7–12 years of age with at least one of the first permanent molars and or incisors that are fully or partially erupted. 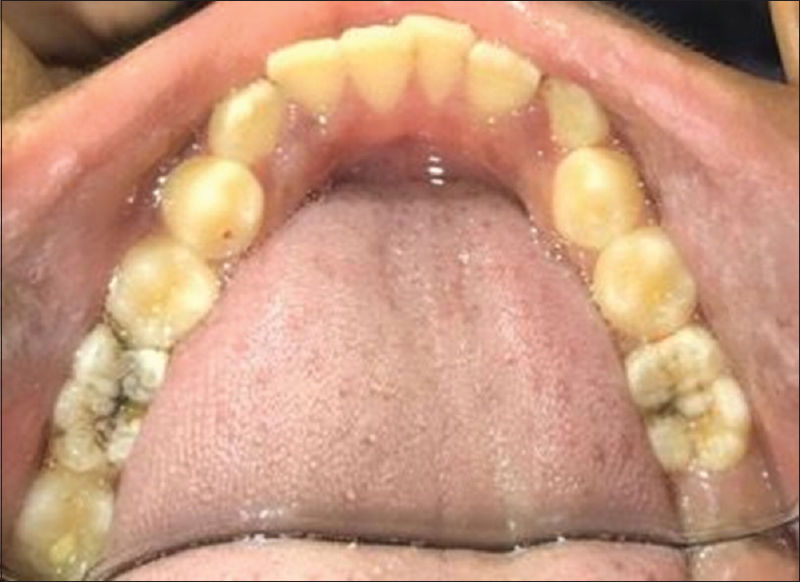 Children with generalized development defects such as amelogenesis imperfecta, dentinogenesis imperfecta, hypoplasia, diffuse opacities, white spot lesions, tetracycline stains, erosion, fluorosis, and Turner's hypoplasia were excluded. Children wearing fixed appliances such as brackets and bands which interfere with evaluation of teeth and uncooperative children were also excluded. The dental examinations were performed in the classroom using a mouth mirror and explorer under a headlight. Teeth were wiped with gauze when necessary to remove plaque or the food accumulations. Surfaces that were examined were the buccal, lingual, palatal, and occlusal surfaces of permanent first molars and labial surfaces of upper and lower incisors. A single examiner was involved to avoid interexaminer bias. All the data were collected and scored using the European Academy of Pediatric Dentistry (EAPD) criteria for MIH. 5 – Unerupted molar due to MIH. A total of 170 children were examined from four different schools. Among them, 85 were male and 85 were female. Fifteen males and 7 females were affected with MIH [Graph 1]. A total of 22 (12.9%) children out of the examined 170 had MIH. Distribution of MIH was more in males, more in 9 years of age. A total of 13 children had first molars affected and 9 children had both incisors and molars affected [Graph 2]. Molars were more affected than incisors. Mandible was more affected. Right side was more affected [Figure 1] and [Figure 2]. The distribution of MIH was more in government schools compared to private schools. The children of age group 7–12 years were selected because at this age most children would have had all four first permanent molars and majority of incisors. These teeth would not have been exposed to the oral environment long enough to develop dental caries. At an older age, there would be a risk of posteruptive breakdown of enamel and caries initiation. Mandibular molars were more affected in this study which could be because they erupt earlier. The prevalence in this study is less than that observed in Kavre district of Nepal. This could be due to the difference in ethnicity and age groups, missing teeth, and unerupted teeth. The other findings were in accordance with the previous studies conducted in Chennai. The highest prevalence found till date is in Brazil of 40.2% in 2009., Worldwide prevalence of MIH shows wide variation ranging from 2.4%–40.2%.,, Weerheijm and Mejà re reported a prevalence rate ranging from 3.6% to 25% after carrying out studies in European countries. Development of the first permanent molars and incisors begins at the 4th gestational month and hard tissue formation in them starts around or soon after birth. Enamel formation in the upper first incisors has been completed by the end of the 5th year of life and in the first molars at about 3 years. Accordingly, human permanent incisors and first molars are at greatest risk for defects caused by systemic environmental factors up to the first years of life. MIH has no hypoplastic defects as there is no discernable reduction in enamel thickness. Any reduction in enamel thickness seen clinically is indicative of posteruption disintegration of enamel. Risk factors noted for MIH in the past were fever in the 1st year of birth, cyanosis, chicken pox, otitis media, ear infections, tonsillitis, urinary tract infections, GIT disorders, asthma, and allergies. Perinatal conditions such as infections during pregnancy, premature birth, birth complications, and family history of enamel defects could be a reason for MIH.,, These conditions could probably cause alterations in the calcium phosphate balance or insufficient oxygen supply to ameloblasts resulting in enamel defects., Conditions common in the first 3 years of life such as asthma, chicken pox, measles, and rubella are associated with MIH. Other systemic illnesses associated with MIH are nutritional deficiencies, brain injury, cystic fibrosis, syndromes of epilepsy, dementia, and lead poisoning. Premature delivery or preterm birth has been associated with increased prevalence of enamel defects in permanent dentition. The enamel defect severity increases with decreased gestational age and lower birth weight. Hypoplasia in any form can predispose a child to develop MIH. Hypomineralization due to prolonged breastfeeding is due to the exposure to polychlorinated dibenzo-p-dioxins. Noncarious hypomineralized molars have underlying pulpal inflammation, as demonstrated by an increase in the pulpal innervation density and immune cell accumulation. Studies conducted by Tobias et al indicate the presence of bacteria in the dentinal tubules of the hypomineralized teeth. Since MIH is an enamel aberration which is seen at the time of eruption of the first molars, the dentinal tubules are still wide in which bacteria could easily penetrate. The increased protein content present in the MIH enamel limits the access of acid to the hydroxyapatite crystallites. The high resistance of MIH enamel to acid etching is consistent with an increased organic content rather than carbonate substitution of the normal apatite lattice. 22q11 deletion syndrome is found to be associated with MIH. These patients have many and complex medical problems including hypocalcemia and hypoparathyroidism. Enamel formation takes approximately 1000 days. Two-thirds of this time is devoted to the maturation stage of amelogenesis. The most critical period for enamel defects of the first permanent molars and incisors is during the 1st year of life coinciding with their early maturation. Ameloblasts are highly sensitive to various environmental disturbances during this period. Patients with MIH-affected teeth suffer from dentine sensitivity to various thermal, mechanical, and osmochemical stimuli due to the porous nature of enamel sometimes, exposing the dentin. This can favor ingress of bacterial contaminants, thereby resulting in chronic inflammation of the pulp leading to a variety of morphological and cytochemical neuronal changes, with an overexpressed dentin sensitivity. Microstructural analysis of sound and hypomineralization enamel shows marked changes which are less dense prism structure with loosely packed apatite crystals and wider sheath regions. These maybe responsible for the marked reduction in hardened and elastic modulus of the affected enamel. 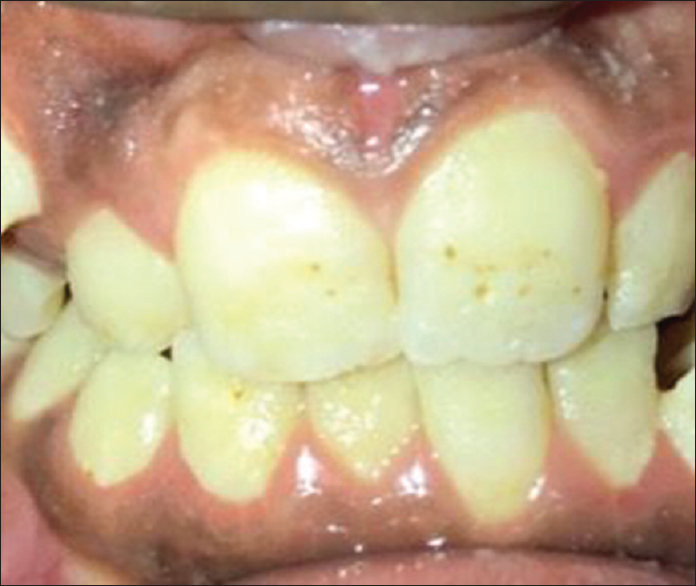 The characteristic distinguishing feature of MIH from hypomaturation defects such as amelogenesis imperfecta or fluorosis is that these two contain high residual amelogenin protein. Pathogenically, this points to a preeruptive disturbance of mineralization involving overabundance of albumin, interfering with mineralization. An indicator of the severity of MIH-affected teeth is the actual organic content of its enamel whereas brown enamel, the most severe form of MIH, has the highest protein content, while the protein content of white/opaque and yellow enamel are both markedly higher than sound enamel. Since this study was done using a very minimal sample size, further studies on larger populations are required to determine the complete prevalence. MIH must be regarded as a public health problem which brings painful consequences, esthetic, and a negative impact on the quality of life of individuals suffering from it. It leads to a number of problems such as poor esthetics, food retention in the defective enamel areas, and higher sensitivity of the exposed dentin. The teeth with this condition can lead to rapidly progressing caries, and hence it is necessary for dentists to identify this condition at the earliest and treat appropriately. Early management of this condition helps in preventing first permanent molar morbidity and mortality so that remineralization as a preventive measure can be instituted. Application of sealants may be an effective approach to prevent carious lesions in MIH-affected first permanent molars. In all cases of MIH, it is essential to review the child on a regular basis to assure their long-term dental health. Shrestha R, Upadhaya S, Bajracharya M. Prevalence of molar incisor hypomineralisation among school children in Kavre. Kathmandu Univ Med J (KUMJ) 2014;12:38-42. Krishnan R, Ramesh M. Molar incisor hypomineralisation: A review of its current concepts and management. SRM J Res Dent Sci 2014;5:248-52. Jeremias F, Koruyucu M, Küchler EC, Bayram M, Tuna EB, Deeley K, et al. Genes expressed in dental enamel development are associated with molar-incisor hypomineralization. Arch Oral Biol 2013;58:1434-42. Tadikonda AN, Acharya S, Pentapati KC. 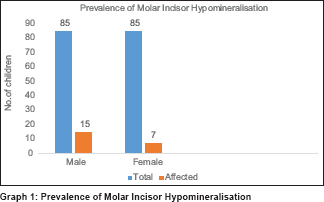 Prevalence of molar incisor hypomineralization and its relation with dental caries in school children of Udupi district, South India. World J Dent 2015;6:143-6. Chellammal MR, Dharman S. Assessment of enamel defects in patients visiting Saveetha dental college, Chennai: A pilot study. Res J Pharm Biol Chem Sci 2016;7:995-1001. Hemagaran G, Arvind M. Amelogenesis imperfect – Literature review. IOSR J Dent Med Sci (IOSR-JDMS) 2014;13:48-51. Neves AB, Jorge RC, Marien JV, Simoes P, Soviero VM. Molar-incisor hypomineralization: A challenge in the dental practice. Dentistry 2015;5:307. Allazzam SM, Alaki SM, Meligy OA. Molar incisor hypomineralisation, prevalence, and etiology. Int J Dent 2014;2014:1-8. Balmer RC, Laskey D, Mahoney E, Toumba KJ. Prevalence of enamel defects and MIH in non-fluoridated and fluoridated communities. Eur J Paediatr Dent 2005;6:209-12. Weerheijm KL, Mejà re I. Molar incisor hypomineralization: A questionnaire inventory of its occurrence in member countries of the European academy of paediatric dentistry (EAPD). Int J Paediatr Dent 2003;13:411-6. Harsha L, Brundha MP. Prevalence of dental developmental anomalies among men and women and its psychological effect in a given population. J Pharm Sci Res 2017;9:869-73. Arrow P. Risk factors in the occurrence of enamel defects of the first permanent molars among schoolchildren in Western Australia. Community Dent Oral Epidemiol 2009;37:405-15. Vieira AR, Kup E. On the etiology of molar-incisor hypomineralization. Caries Res 2016;50:166-9. Allam E, Ghoneima A, Kula K. Defi nition and scoring system of molar incisor hypomineralization: A review. Dent Oral Craniofac Res 2017;3:1-9. Serna C, Vicente A, Finke C, Ortiz AJ. Drugs related to the etiology of molar incisor hypomineralization: A systematic review. J Am Dent Assoc 2016;147:120-30. Crombie F, Manton D, Kilpatrick N. Aetiology of molar-incisor hypomineralization: A critical review. Int J Paediatr Dent 2009;19:73-83. Sadashivamurthy P, Deshmukh S. Missing links of molar incisor hypomineralization: A review. J Int Oral Health 2012;4:1-11. Jayakumar A, Gurunathan D. Relationship between low birth weight in children and early childhood caries – A systematic review. Int J Pharma Bio Sci 2017;8:484-8. Garot E, Couture-Veschambre C, Manton D, Beauval C, Rouas P. Analytical evidence of enamel hypomineralisation on permanent and primary molars amongst past populations. Sci Rep 2017;7:1712. Seow WK. A study of the development of the permanent dentition in very low birthweight children. Pediatr Dent 1996;18:379-84. Farah RA, Monk BC, Swain MV, Drummond BK. Protein content of molar-incisor hypomineralisation enamel. J Dent 2010;38:591-6. Klingberg G, Dietz W, Oskarsdóttir S, Odelius H, Gelander L, Norén JG, et al. Morphological appearance and chemical composition of enamel in primary teeth from patients with 22q11 deletion syndrome. Eur J Oral Sci 2005;113:303-11. Reid DJ, Dean MC. Variation in modern human enamel formation times. J Hum Evol 2006;50:329-46. Rodd HD, Morgan CR, Day PF, Boissonade FM. Pulpal expression of TRPV1 in molar incisor hypomineralisation. Eur Arch Paediatr Dent 2007;8:184-8. Fagrell TG, Dietz W, Jälevik B, Norén JG. Chemical, mechanical and morphological properties of hypomineralized enamel of permanent fi rst molars. Acta Odontol Scand 2010;68:215-22. Farah R, Drummond B, Swain M, Williams S. Linking the clinical presentation of molar-incisor hypomineralisation to its mineral density. Int J Paediatr Dent 2010;20:353-60. Lygidakis NA, Wong F, Jälevik B, Vierrou AM, Alaluusua S, Espelid I, et al. Best clinical practice guidance for clinicians dealing with children presenting with molar-incisor-hypomineralisation (MIH): An EAPD policy document. Eur Arch Paediatr Dent 2010;11:75-81. Weerheijm KL. Molar incisor hypomineralization (MIH): Clinical presentation, aetiology and management. Dent Update 2004;31:9-12.